After a music-filled day at the Red Wing Roots Music Festival and a good night’s rest at a friend’s beautiful home in Waynesboro, we ventured out on Sunday, July 14th for breakfast, the flea market and wine (not all at the same place). With the notes of the late night music of Sam Bush still ringing in my ears, I was ecstatic to find a couple New Grass Revival LPs at the flea market…in the same box with Act 1 – The Seldom Scene, Old & in the Way (all the greats…Jerry Garcia, David Grisman, Peter Rowan, Vassar Clements and John Kahn) and my very first (yeah, I know…what took me so long?) 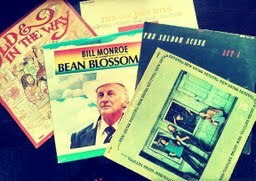 Bill Monroe recording – Bean Blossom ’79. The Act 1 vinyl is not in the best shape, but what fun to listen to Mike Auldridge, John Starling, John Duffey, Ben Eldridge and Tom Gray in this 1972 recording and finally gain an understanding of the passion for The Seldom Scene that still exists today. The perfect ending to a music filled weekend included visits to Cardinal Point Vineyard & Winery and Flying Fox Vineyard in beautiful Afton Mountain. If you’re a music festival lover who likes wine, or a wine lover who likes music festivals – you might want to make room on your calendar for the 2014 Red Wing Roots Music Festival where you can take in 3 days of great music and also visit a few of Virginia’s 150+ wineries. This entry was posted in For Your Information and tagged Bean Blossom, Ben Eldridge, David Grisman, Flying Fox Vineyard, Jerry Garcia, John Duffey, John Starling, Mike Auldridge, Peter Rowan, Red Wing Roots Music Festival, The Seldom Scene, Tom Gray, Vassar Clements by chestnuthouseconcerts. Bookmark the permalink.